Standiford Family: "Buy Me Some Peanuts and Cracker Jacks"
Peanuts and Cracker Jacks are not sold at our little league ball park but they sell other yummy things. That is if you like junky food. Kade had a game tonight and we all had to grab something before we left. Meg was already at her practice but she walked over afterward. We told them they could get something at the concession stand later. Meg got a slice of pizza. Mat got two ring pops. 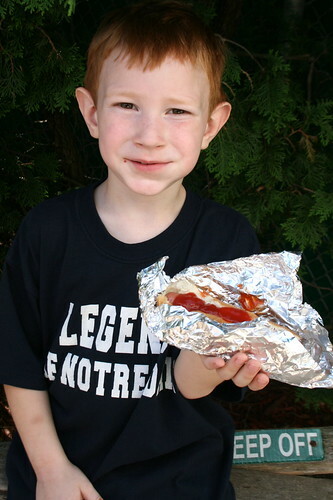 And Kade got what he likes to get after every game....a hot dog smothered in ketchup. Notice his full left cheek. He has a BIG bite in there. Mmmmmm ... I love baseball hot dogs ! Great choice Kade.